Not quite happy with your photos? Tricky weather and lighting conditions or a stranger in the background have ruined a priceless shot? Vacation pictures don’t look as vibrant as you hoped they would? With PhotoWorks in hand, you’ll get the tools that let you save a spoiled shot or turn an average picture into a photography masterpiece. This seemingly simple photo editing program has the latest image processing technology under the hood – for you, this means perfect pictures with a couple of mouse clicks! Need to touch up a portrait or make a shiny avatar? The intelligent photo retouching tools inside PhotoWorks will hide any imperfections and add a glam finish to your picture. Get rid of pimples, freckles, and spots; smooth out wrinkles and create an even skin tone; whiten your teeth for a luminous smile. Feel like experimenting with your looks? Try changing the eye color – just one mouse click, and your grey eyes will turn green! Make sure to try the built-in photo filters, too – these will turn an ordinary shot into a studio-quality picture. Some of your valuable vacation photos were taken in gloomy weather? You can’t go back to that place, but you can add some sunshine with an easy image editor! Discover the power of the graduated filter – this tool can work wonders for your landscapes, turning the grey sky blue and breathing life into a dull photo. Erase unwanted objects such as power lines, road signs, or passersby. Do some magic with artistic effects – there’s an an array of presets like morning mist, winter frost, summer glow etc., ready to give your pics a rad new look. Have immense fun playing with hues and tones! One quick movement, and your red dress turns pink or orange; another one – and day becomes dusk. Play with the color hue, saturation and luminance to change the atmosphere of the shot. 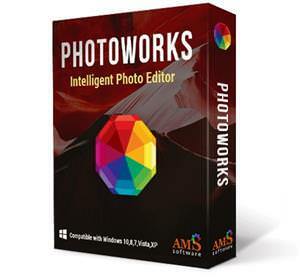 PhotoWorks uses intelligent technology that lets you work with each color on the photo one by one, without you having to do any manual selection. Looking for instant photo effects? We’ve got you covered! PhotoWorks comes with a huge variety of artistic filters – color toning, details enhancement, HDR, vignetting, retro, black & white photo, color splash, seasonal effects, and a lot more. A single click will create a certain mood, add some drama or a romantic vintage flair to your shot. Even if you are completely new to post-processing, our simple picture editing software will give your images a polished look in mere seconds. Add stylish captions, or watermark images to protect your work. Rotate text or make it semi-transparent if necessary. Level out a wonky horizon, eliminate the “falling building” effect, correct lens distortions in a few clicks. Use an array of brushes to work with any object on the photo – for example, fix small blemishes or accentuate a detail. Improve the photo composition with crop presets – the Rule of Thirds, the Golden Ratio and other grids are there to help. Apply auto enhancement to fix the exposure and improve the color balance. Make your image awesome in one click! Discover professional secrets and master new image editing techniques with our series of online tutorials.